Brooks Lindsey from Mississippi in the US rushed back home after hearing that his wife, Haley, was about to give birth. Quick thinking prevented this soldier from missing his daughter’s birth! Brooks Lindsey from Mississippi in the US rushed back home after hearing that his pregnant wife, Haley, was about to give birth. 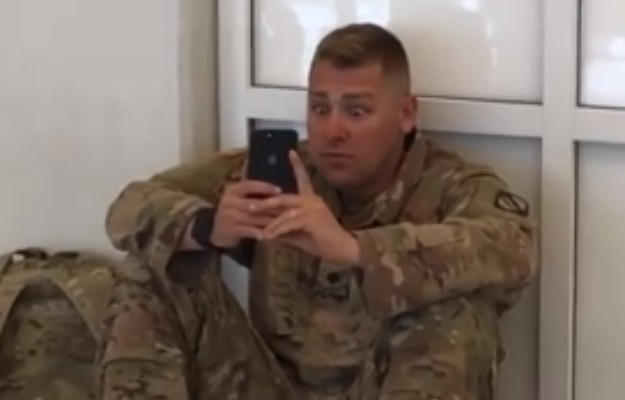 But the American soldier faced a setback after his flight was unexpectedly delayed, which left him slumped in an airport corner as he watched his wife giving birth to their daughter, Millie Fritz Anne Lindsey, on FaceTime, Independent reports. A video of an emotional Brooks watching the birth as he nervously took deep breaths was filmed by a woman travelling with him from El Paso, Texas, and garnered more than 260 000 views on Facebook. “This soldier was on my delayed flight home yesterday to MS [Mississippi],” Tracy Dover wrote. “He had to watch the birth of his daughter on FaceTime. He was crying and our hearts were breaking. Wife Haley told Love What Matters that she attended a doctor’s appointment on Thursday and was told they’d induce labour because her baby was under stress. “I called Brooks, frantic, and he was so excited!” she said. As per military protocol, the mom-to-be had to phone the Red Cross in order for the new father to come home. “I get to the hospital at 3pm Thursday and they confirm my state and tell Brooks to book a flight from El Paso ... to Dallas layover then to Jackson but that he couldn’t book a flight until after 10am the following day! On the Friday Haley’s water broke just three hours before her husband arrived at the airport in Texas. “He called me as soon as that flight landed in Dallas at 2:38 central time and I was 5cm dilated. “He was scheduled to take off at 3:55 but luckily his flight was delayed to 5:45. Without that delay Brooks would have been in the air and unable to FaceTime!” she says. Brooks’ mother then secretly FaceTimed him from the labour ward, trying to hide it from the doctor. But when the doctor saw what was going on, she was moved and encouraged the proud mom-in-law to continue live-streaming the birth to her son. “Brooks was telling me it was okay, and I was doing so good and I heard him wincing and saying ‘Wow!’ through my pushes. I could hear people in the airport talking and cheering! “Brooks then went on to say they were making him board and he needed to get off as soon as she finally started to crown and all I remember was my doctor screaming, ‘Don’t let him board the flight! She’s here! She’s here!’ So, the airport personnel let him sit there and watch till it was over!” she says. When the new dad saw his daughter being born on screen he cried. Brooks then hurried back home on the next flight. “When he walked in at 7:20 it was just Millie and me. He picked her up and held her for five minutes and kept saying, ‘Wow I can’t believe we just had a baby’ but the entire time I was already dreading him leaving four days later,” Haley says.